Allnigeriasoccer.com can exclusively report that highly-rated Chelsea youngster Faustino Anjorin could depart Stamford Bridge in the summer transfer window as he is attracting serious interest from Bundesliga and Ligue 1 powerhouses. Borussia Dortmund and Paris Saint-Germain are exploring ways to sign the midfielder when the transfer window opens for business. Several Nigeria-eligible players have recently opted to move abroad in search of first-team football and Anjorin could be next in line to end his association with a Premier League club. Ex-Tottenham Hotspur U16 captain Nonso Madueke joined PSV last summer, former Manchester City defender Ashinme Kigbu moved to Wolfsberger AC and has made four appearances for their first team to date, while Keanan Bennetts signed for Borussia Mönchengladbach. 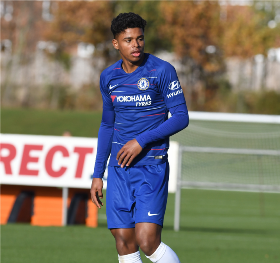 Anjorin is regarded as one of the most exciting prospects at Chelsea and was fast-tracked into their U23 squad at the age of sixteen before penning a professional contract on his 17th birthday. Meanwhile, the versatile midfielder is undergoing rehabilitation after suffering a back injury and will play no part when Chelsea U23 team face off with Swansea City in the Premier League 2 on Friday evening. Chelsea don't want to rush him back and expect him to spend two more weeks on the sidelines as a precaution.